Ha ha ha ha ha ha hahahah!!!!!!! This is kind of fun to do! The wedding wing that my mother gave me: Due to a mishap at the end of the summer I was unable wear it on my left ring finger (I dislocated my finger on a rope swing and the finger was swollen for far too long). It is now on my right hand and has been even though it now fits in its proper place. The other day while I was at a soccer game between the different neighborhoods of Dakar I ended up explaining this ring to a couple of my Senegalese guy friends. Not wanting to miss an opportunity to learn I asked if they ever keep their eyes open for rings on the fingers of girls before they start hitting on them. Of course they both said they do, but in general, because wedding rings are not ‘a thing’ in this country it probably wouldn’t work. I’ve noticed it doesn’t really work. Sorry Mom and Aunt C…Nothing bad has happened mom, no worries, I’m still your sweet innocent baby girl. But getting hit on is a huge thing here. One of the phrases I know really well now in Wolof is “am na jekker?” Which means, do you have a husband? And I think really that it is just a joke. 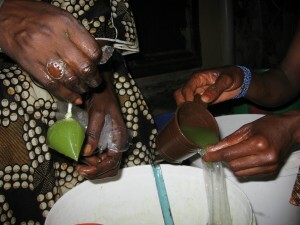 The Senegalese love to talk so its just one way to carry on a conversation. Still I hate having to lie about my fake husband (who is sometimes American and sometimes Senegalese, once he was even Russian, and once I told the taxi-man who asked the question that he was delivering me to my husbands house). It can get pretty annoying, really really annoying actually. But it never got dangerous. My name: earlier I said it was Fatima Fall. Well actually I spelled it wrong. My name doesn’t have an ‘i’ in it it is just Fatma. But honestly when every other woman you meet is named Fatima, Fatma, Fatou, Fatoumata, or any derivation of the same name it hardly matters. In sickness and in health: I watched some of the other students get really sick. That was really hard. I felt so bad and there was so little I could do. So I counted my blessings every day and I never got really unpleasantly sick at all. I apologize if this is too much information but we study frequently talked about subjects such as illness. Ironically I have the runs now, now that I am back in a first world country. Thanks! At least there is regular toilet paper. 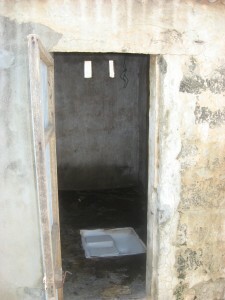 Here’s a picture of a regular squat toilet for your pleasure. Becoming a ‘white Senegalese’: well when I had mile long fake braids dangling from my scalp the annoying street people called me ‘Madame Senegal’. When I wore clothes made out of the traditional waax fabric the same sorts of people would call me Senegalese but it never made me feel very Senegalese. That just made me feel like a Toubab (white person) dressing up. The Beach: I had an interesting relationship with it. Sometimes it took some convincing to get me out there. I realized that I really don’t like salt water. I also don’t like the vendors who come up to you, sit next to you, and never take no as an answer. But after doing yoga on the beach, walking along it for hours, listening to it at night, skinny dipping in it, I still find it sort of a paradise. Drumming and Dancing classes: I’m incredibly disappointed that these sorts of classes were such a tiny part of the entire program. I have a djembe now. I bought one that was made by our instructor and I will carry it through every airport from here to Montana but I still don’t feel like I really learned how to play it. Motorcyles with multiple people: one of the best nights ever! Wedged in between two muscular Senegalese man friends the three of us rode along the cliffy coast of Dakar in the dark yipping and scaring ourselves for no reason. Since then I’ve hopped on the back of my friend’s bike a couple different times. Each time is mildly terrifying but leaves me with a smile. Sabar: The toubab in the picture I posted of the Sabar is one of the reasons I loved dancing in Senegal so much. In my last blog post I briefly said that our academic director hired drummers and dancers to do a little show at our hotel? Well in the middle of the performance while the dancers are kind of taking turns showing their Sabar moves our friend hops up and dances so freely and with such spirit it made me cry. In his own words “I love dancing because it… it just feels like what your body wants to do all the time”. I don’t give my Dakar host family enough credit: they really are great to me. I miss my yaay’s frozen juice bags. When I went back to visit they were always so so so nice! My yaay made me this great pair of pants and a shirt to match that I promptly wore out to that first saturday of the month party that I also mentioned at one point. The pants were well appreciated while dancing (it sure wasn’t my dance moves that were). I miss the random neighbors who would always drop by and occasionally have hilarious conversations with me. and CONGRATULATIONS to my host brother who is getting married on the 7th of January! He’s getting married to a cousin and everyone is so happy! Here’s to the Baobab Apartments: We had so many good times in that apartment. Fatima 2 (a Senegalese pseudonym) breaking the couch with her big bum. The lovely stray SIT student who would share our huge bed. Watching Modern Family in a big doggie pile. Entertaining our Senegalese guests on the tiniest balcony ever and still it stands. Here’s to Baobab and the people in it and that last crazy month that we spent together! And now to my next adventures. I will try to continue blogging as I go to Barcelona for several days then to Southern France on trains that may already be completely booked, and a volunteer opportunity that may not have a lot of work for me to do. Yee haw!